Nakamura"- Little Kyoto" SUBPAGE | All Japan Kyoto Association"
Nakamura was built by a former Kanpaku (samurai government general), Norifusa Ichijo, after he escaped from war fires in Kyoto and came to this place to reproduce Kyoto corresponding with the ancient topography. The city followed the grid pattern like Kyoto and some of the areas were named after those in Kyoto such as Gion, Kyo-machi, Kamogawa and Higashiyama. 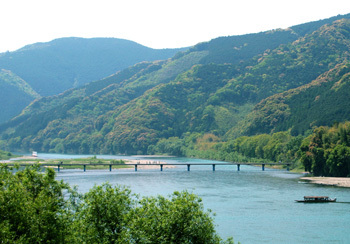 The urban area is surrounded by the pure Shimanto River and its tributary, the Ushiro River. This landscape with rivers closely resembles Kyoto. The Ichijo Family in the Tosa region prospered for 106 years through five generations. 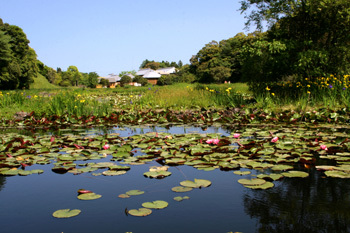 The family was strongly influenced by Kyoto culture and created a unique elegant cultural sphere which has been inherited by modern-day Nakamura. 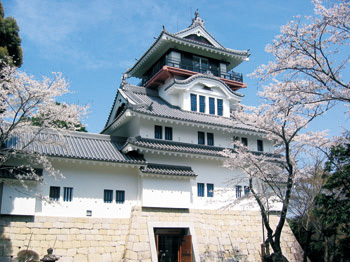 The nature in this city retains its original landscape including the Shimanto River and is known as an exceptional habitat for dragonflies as well as wild birds. The last pure stream, the Shimanto River, has rich river resources and is the habitat for more than 200 different kinds of fish. Along the river is a great place to appreciate nature with outdoor activities including excursions by boat, kayaking, camping and more. This shrine enshrines Kaneyoshi Ichijo, an aristocrat from the Muromachi period and succeeding Ichijo family members from the Tosa area. 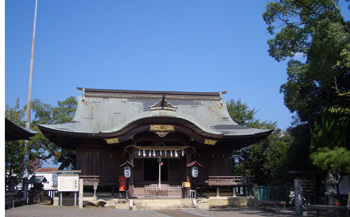 The shrine is famous for the Ichijo Taisai Festival. This area is the No.1 habitat for dragonflies and some 77 different kinds are found here. An Akame snook is exhibited in an aquarium. 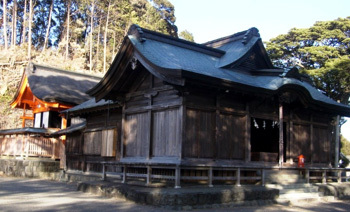 Norifusa Ichijo had the deity transferred to this place from Iwashimizu Hachiman-gu Shrine. 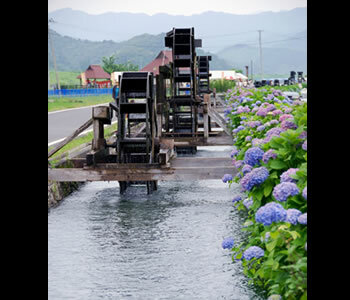 A number of small and big water wheels twirling in the midst of the rice fields provide a nostalgic scene. City’s historical documents are exhibited. Great view from the rooftop of the museum. *The museum is presently closed due to renovation. Some parts are scheduled to be reopened in March, 2018, and fully opened in February 2019. This mustard blossom field is spread out along the Shimanto River. At the site, an out-door tea ceremony, a Japanese harp music concert, local products fairs and a bamboo lantern light up will be held. 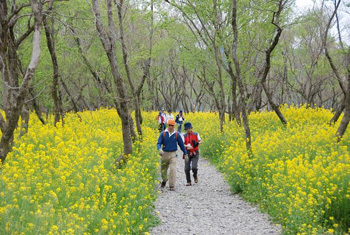 This walking festival enables participants to feel the rich nature by walking along the beautiful Shimanto River. 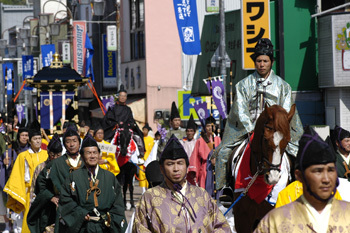 This is a grand pageant procession recreating the day when the former Kanpaku, chief advisor to the Emperor, Norifusa Ichijo, entered Nakamura City. The court noble procession consists of 200 participants and will parade through the city. 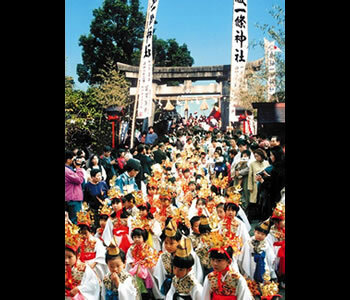 This is a summer event consisting of dance, and Chochin paper lanterns on floats parading through the city. 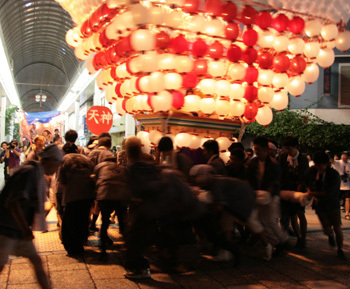 Swirling around the float is a dynamic highlight of this festival. 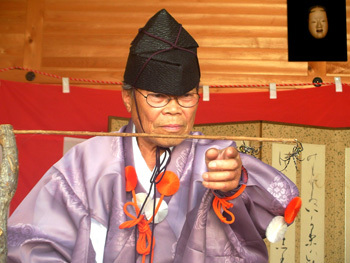 Two Kogane-gumo spiders will be set on one stick together, then fight against each other. The event is held for the sake of creating a summer memory for children. 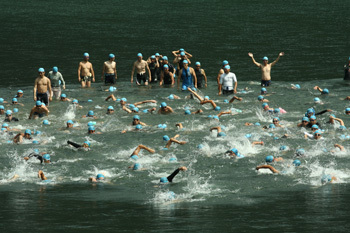 Participants start swimming from one of the popular sightseeing spots, Sada Chinka Bridge and finish 5 km downstream. There is also a shorter 3.5-km race in which people of all ages can join. Mt. 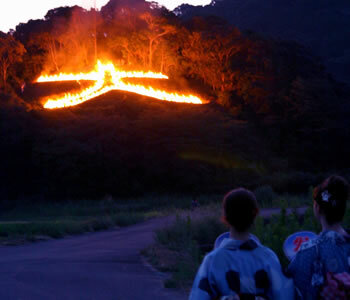 Judaiji will become blazing red as the fire is lit on the mountain, displaying a fantastic scene. 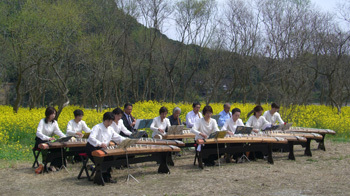 With this event, local people know the summer is nearing its end and autumn is coming. 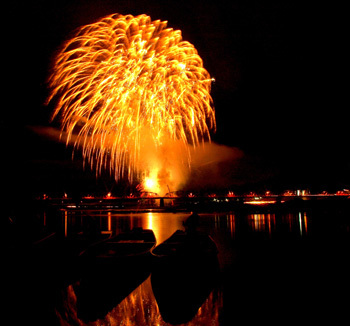 As the fireworks burst with music, the night sky will be illuminated with a variety of colors reflecting on the surface of the Shimanto River. 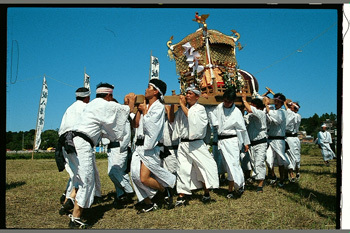 In this festival, the wedding ceremony for the god will be held. This is a very rare ritual in the country. 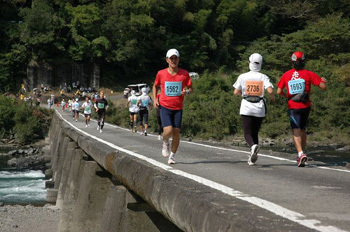 There is a 60-km and 100-km marathon along Shimanto River and about 2,000 runners will participate from all over the country. This is one of the three major festivals of Tosa and many stalls will line the streets in the downtown area and the children’s parade will create a festive mood. 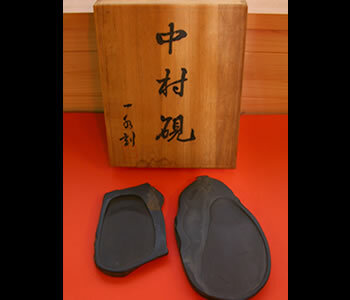 Nakamura’s Suzuri ink stone is good for the practical use as well as for ornamental purposes. Its material is compared favorably with Tankei and Kyuju ones from China. 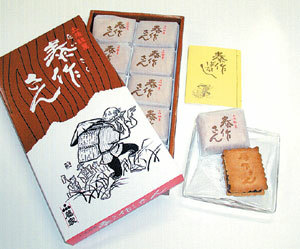 This is a confectionery in which yokan (sweet red bean bar) is sandwiched by cookies. It has an elegant sweetness and goes well with tea. Please try it when you visit Nakamura. 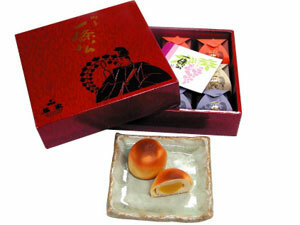 This sweet was made to commemorate the virtue of the Tosa Ichijo Family. Carefully selected Tosa’s chestnuts are first steamed then coated with bean paste one by one. 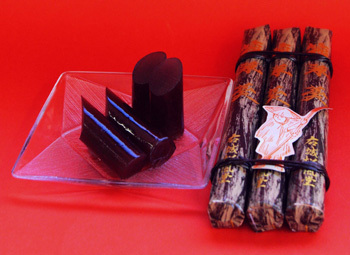 A Yokan is a bar of sweetened and jellied bean paste. Ikada Yokan is made recreating the scene of an ikada raft floating down the Shimanto River. 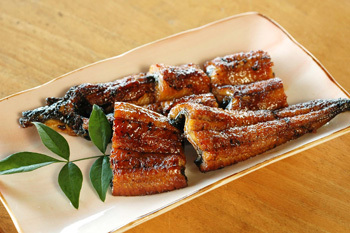 Shimanto River’s wild eel has a rich flavor and chewy texture. 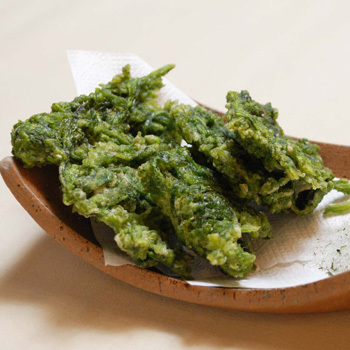 The fresh Aosa seaweed is fried in Tempura style. This is a local dish with a rich flavor. 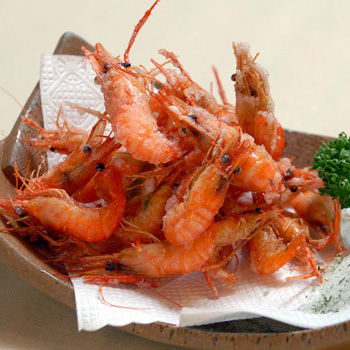 The fresh shrimp caught in Shimanto River is fried and you can enjoy its vivid color and crunchy texture. Gori is a fish that is caught in the Shimanto River. 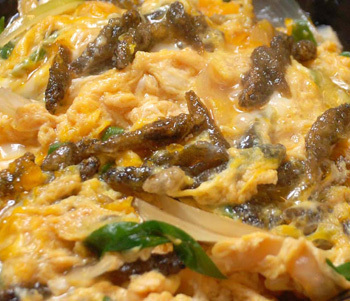 This is a dish in which gori and dried daikon radish are cooked together and then fried with egg.